Georgia Tech hosted the first annual ACC InVenture Prize on April 15-16, 2016. Fifteen universities sent competitively selected teams to Atlanta. In the preliminary round all 15 teams were given 5 minutes to “pitch” their invention before a panel of alumni judges. The five highest ranked teams repeated their pitches during an hour long PBS show broadcast live in six states. The winning team from Duke took home a $15,000 prize. Virginia was runner up and Georgia Tech was “the peoples’ choice”. Information about each of the projects is available at acc.coe.gatech.edu. Georgia Tech has generously agreed to host the 2nd annual competition in April 2017. For more information, contact Chris Reaves at chris.reaves@gatech.edu. Duke student Ivonna Dumanyan ’16 and alumna Gabby Levac took first prize for their startup, BioMetrix. 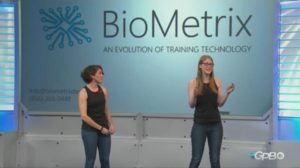 BioMetrix offers a wearable sensor that adheres to the skin, collects data and uses cloud services to quantify rehabilitation progress and provide real-time feedback to reduce athletic injuries.